HEPA stands for high-efficiency particulate air. A HEPA filter is a microporous filter that traps small particles of dust, dander, and debris that have been vacuumed up to keep them from circulating back in the air. Vacuum cleaners that are unequipped with HEPA filters can actually make your allergies worse by spitting allergens back into the air. Another essential part of a good anti-allergy vacuum is anti-allergen seals, which work hand-in-hand with HEPA filters to track allergens. These seals keep the canister closed tightly as to trap all the dust, debris, and particles to prevent their escape. You want to look for units that have both filters and good seals because the combination can decrease the number of asthmatic or allergic reactions. A vacuum is worthless if it can’t lift the allergens from your carpets in the first place. That’s why strong suction technology is important. Allergens are tiny particles and you need the best suction to lift them out of the fibers. Look for a vacuum with suction control, as it usually has better suction (on the strongest setting) than a one size fits all vacuum. In general, you want to find a vacuum that has low emissions. Emissions are the pollutants that come from a vacuum cleaner while the person is vacuuming. If you’ve ever been vacuuming and felt something fly back at your feet, you’ve experienced emissions. A low emissions vacuum will trap allergens effectively. 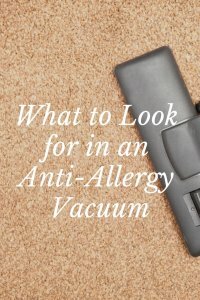 This isn’t something specific to look for in a new vacuum, but its best to start with a clean slate when starting to vacuum to reduce allergies. Often, the build-up left from years of bad vacuums means that your new vacuum won’t be able to remove all of the allergens, no matter how good it is. A professional carpet cleaner can give your carpets the deep clean they desperately need, and then a good vacuum can prevent allergens from accumulating again. With the right care, your carpet doesn’t have to be a source of allergies for you and your family! A good vacuum anti-allergy vacuum can be just what you need!